Now Offering Hand Pan Lessons! You’ve seen the viral videos online. Now you can finally try a hand pan for yourself! I’m now teaching private lessons on hand pans. You can use one of my hand pans during your lesson. Then, Rick will give you materials and patterns to practice before your next lesson. 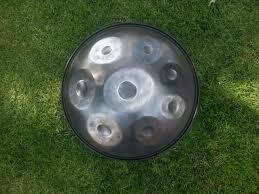 The Hand pan, also called Hang Drum or Halo, is quickly becoming a very popular instrument. It’s unique sound and (relative) ease of play makes it a great instrument to make music by yourself or with others. As soon as we get a few more hand pans in we’ll start doing group classes. This should happen by the end of the 2016. There is a long waiting list for these amazing instruments so getting 3 or more takes a long time. I’ve ordered a bunch of hand pans and rentals will be available by 2017. To get on the waiting list for one of these please send me an email at rmsteelbands@mac.com.